TM 9-2350-261-20-1 1. Inspect accelerator linkage for bent, loose, broken or missing parts. 2. With pedal (1) in full throttle position, travel spring (2) should be compressed so that a gap of 1/64 to 3/64 inch (0.4 to 1.0 mm) exists between pivot pin (3) and rod stop (4). 3. Are accelerator linkage parts in good condition, cor- 1. Remove air cleaner element (see your -10). 2. Remove air cleaner hose (page 7-3). 3. Inspect air cleaner hose (l), engine intake (2), and air cleaner cover (3) for signs of obstruction or collapse. 4. Are air cleaner hose, engine intake, and air cleaner 1. 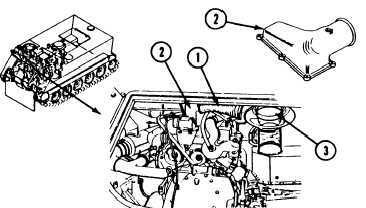 Repair/adjust accelerator linkage parts (page 23-27). 2. Verify no faults found. 1. Remove any obstructions. 2. Replace unserviceable air cleaner hose (page 7-3) or air cleaner cover (page 7-5). 3. Verify no faults found. GO TO NEXT PAGE 3-47 rectly adjusted, and working properly? cover serviceable?